In March 1941, Jimmy Stewart, America’s boy next door and recent Academy Award winner, left fame and fortune behind and joined the United States Army Air Corps to fulfill his family mission and serve his country. He rose from private to colonel and participated in 20 often-brutal World War II combat missions over Germany and France. In mere months the war took away his boyish looks as he faced near-death experiences and the loss of men under his command. The war finally won, he returned home with millions of other veterans to face an uncertain future, suffering what we now know as PTSD. Younger stars like Gregory Peck were now getting roles that might have been Stewart’s, and he didn’t know if he would ever work in Hollywood again. Then came It’s a Wonderful Life. For the next half century, Stewart refused to discuss his combat experiences and took the story of his service to the grave. 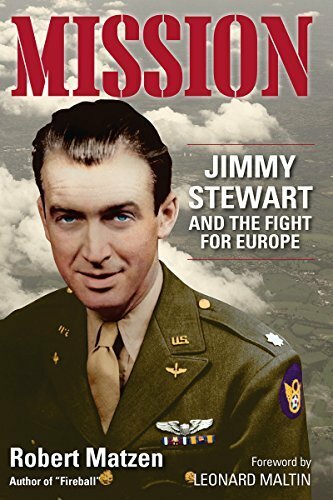 Mission presents the first in-depth look at Stewart’s life as a Squadron Commander in the skies over Germany, and, his return to Hollywood the changed man who embarked on production of America’s most beloved holiday classic. Author Robert Matzen sifted through thousands of Air Force combat reports and the Stewart personnel files; interviewed surviving aviators who flew with Stewart; visited the James Stewart Papers at Brigham Young University; flew in the cockpits of the B-17 Flying Fortress and B-24 Liberator; and walked the earth of air bases in England used by Stewart in his combat missions of 1943-45. What emerges in Mission is the story of a Jimmy Stewart you never knew until now, a story more fantastic than any he brought to the screen. This book has been on my wish list for some time. It finally went on sale on kindle and of course I got it. I have enjoyed watching some of Jimmy Stewart’s movies and I enjoyed reading about the actors background. I love World War II stories and this was an amazing one. It talked about his acting and war career and both were very personal. I enjoyed all the war stories that were in this book. Jimmy Stewart did a lot of things wrong that I disagree with such as making out with different Hollywood woman which is talked about in this book. I also did not like how it sometimes jumped around to different people’s lives in the book. It was important, but I would have preferred if the author had stayed more focused on Stewart.